I’ve had a love/hate relationship with writer Richard Curtis for many years now. I mean this quite literally, by the way. I either love what he writes or I hate it. I grew up with Blackadder and love the show unconditionally. I am aware, however, that the first series, written by Curtis alone, was nowhere near as good as the subsequent three series, during which he collaborated with Ben Elton. On the other hand, I actively hate Curtis’s movies, with Love Actually representing the epitome of all that irritates me about him; boring, predictable, emotion-by-numbers, with an almost cartoon vision of Britain designed to appeal to American preconceptions. Blah! So, when I discovered that Curtis had written this week’s episode of Doctor Who, I was eye-rollingly under whelmed. I expected a brief and vexing hiccup in what has been, for me, the best season since the show returned in 2005. After David Tennant and producer Russell T. Davis had exhausted my patience to the point where I had all but given up on a show I’ve been watching since I was born, along came Matt Smith and Steven Moffat to bring me back into the fold. I was sure I could endure a dose of Curtis candy just this once. As it turns out, that candy will come in useful. I can sprinkle it on the humble pie I’m about to eat. Vincent and The Doctor was, if memory serves, the first Doctor Who episode that made me weep like a child. The Doctor and Amy are visiting the Van Gogh paintings in the Musée d’Orsay, when the Doctor notices a strange face in the window of a church, in a painting Van Gogh did during the last year of his life. They travel back to 1890 Provence to meet him and discover the identity of the strange face. They find Van Gogh an outcast in the town; broke, eccentric, unappreciated, tormented by his depression, and the only person in the town who is able to see the monster which is killing the inhabitants. Tony Curran does a great job of portraying the energy and mood swings of the mentally ill painter, and the episode handles the topic itself with a lot of respect. The monster itself is a bit lame, but it doesn’t matter because, for once, it isn’t about the monster at all, but the man. The monster is defeated, there is a great little scene where we see the night sky as Van Gogh does, but it is the final scene that really did me in. The Doctor takes the artist to the Musée d’Orsay in 2010, to show him what his work will mean for generations to come, and as Van Gogh broke down in tears, I couldn’t help but join in. Beautiful. Now, I don’t know how much of this was down to the writing of Richard Curtis, the performance of Tony Curran, or simply the themes that resonated in me because I am me. But at least, if I make it and someday meet Richard Curtis, I won’t have to tell him that the last thing he wrote that I loved was screened in 1989. 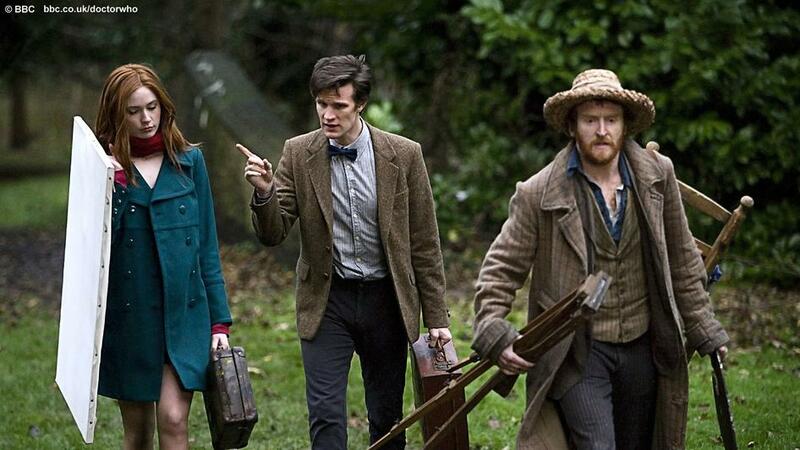 Amy, The Doctor and Vincent Van Gogh about twenty minutes before I start blubbing. This entry was posted in Feature Articles, Television and tagged Ben Elton, Blackadder, David Tennant, Depression, Doctor Who, Love Actually, Matt Smith, Mental Health, Richard Curtis, Russell T Davis, Steven Moffat, Tony Curran, Van Gogh, Vincent and The Doctor, Vincent Van Gogh on June 5, 2010 by CZombie.